Achieve more for less by delivering predictable and consistent services. Stop 'one-off' project mentality and move to delivering repeatable, high-quality engagements to increase efficiency and improve resources utilization. ITIL's service catalogue has primarily been focused on productizing support maintenance services. As a result, services delivered through projects have traditionally been left outside the scope of service catalogues in the belief that projects cannot be productized. Join us for an in-depth discussion with eTask Technologies CEO Juan Manrique as he explores the benefits of productizing project based services and shares tips on how to capitalize on this new industry trend. 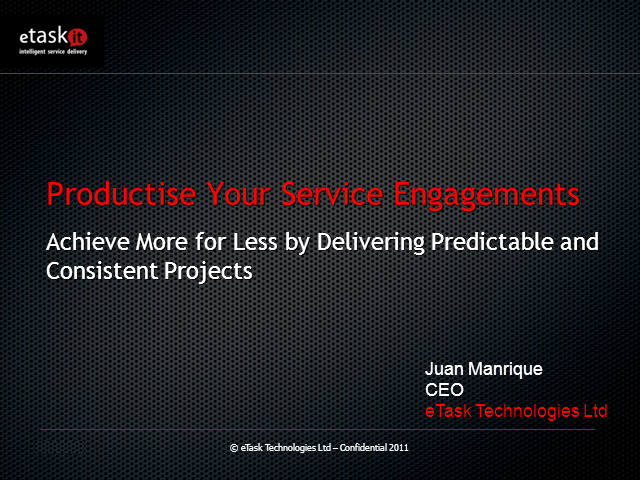 Learn how to achieve more for less by productizing your services.